Here we were back at Nottingham University for another Indoor Scale Nationals and I am pleased to say that entries were up on last year in every class, including one or two new faces entering for the first time - a healthy sign. Plenty of visitors and fun flyers made the trip too, and the spectator balcony seemed full all day. All in all a good atmosphere, enhanced by the commentaries by Charlie Newman and Peter Smart. Speaking of Charlie, this was the last Indoor Nationals that he will be organising, and our grateful thanks are due for his efforts over the last years, which have contributed to making this event so successful. Before the photos here is a quick reminder of the BMFA competition classes and their different rules. Please skip these paragraphs if you have read them before! The Open Rubber and CO2 / Electric classes have a total based on flight score plus static score, split 50/50. Four flights can be made and the score from the best flight counts. Static judging is very rigorous, and comprehensive documentation is required from the entrants. To qualify, you have to make a flight of only 15 seconds. This does not sound much, until you actually try it! The flights are judged on realism in the various stages of the flight, i.e. take off, climb out, cruise, approach and landing. No extra points are given for longer flights than 15 seconds. 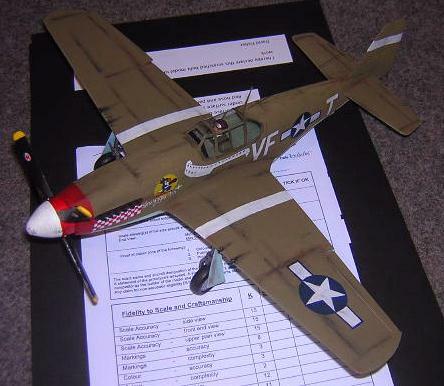 Thus a very detailed, heavy model can score lots on the static points, and should be capable of a 15 second qualifying flight. 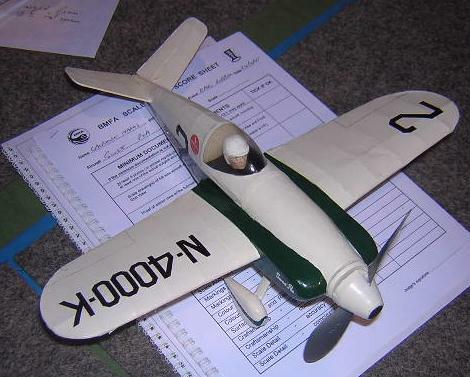 Of course, a heavy model will fly faster (too fast for scale speed usually), be harder to trim and probably do less well on the flight score than a lighter model (they also hit the wall harder!) As always, it is a fine balancing act between weight and detail. The Peanut (13" wing span) and Pistachio (8" span) classes have different rules, in that the flying scores do depend on flight time. Realism in flight is not judged, just the time it stays up. You get a ten second bonus if you ROG (Rise Off Ground). Nine timed flights can be made and the best two are added together to give you a flight score (in seconds). 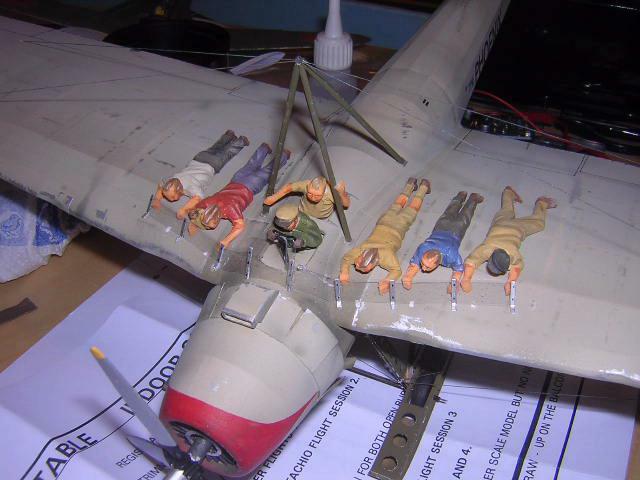 The models are ranked in order of flight performance, and also in order of static judging. Bonus points are given in the latter for such features as multiple wings, scale rib spacing, having a pilot, separate control surfaces, exposed engine detail etc. The final positions are obtained by adding the flight position to the static position - lowest score wins. For example 2nd in static and 3rd in flight would give you a total of 5 points. 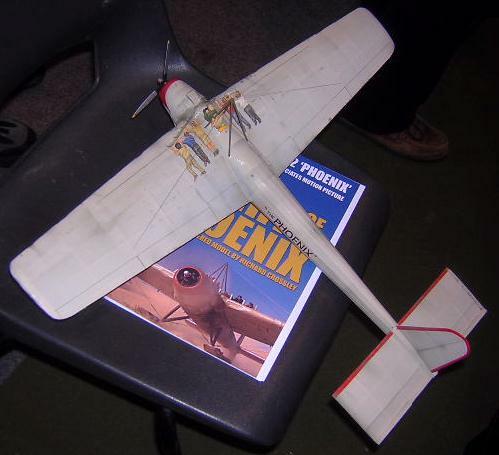 No new models from the Stuart workshop this year, so I just entered the Sparrowhawk and Fox Moth again. In contrast to last time, the Sparrowhawk was rather overpowered with two loops of 1/8" runner, so it climbed rather too high, followed by a very steep descent when the rubber ran down. For the afternoon session I changed the motor to 2 loops of 0.115" rubber, which worked better, and I got one decent qualifying flight. 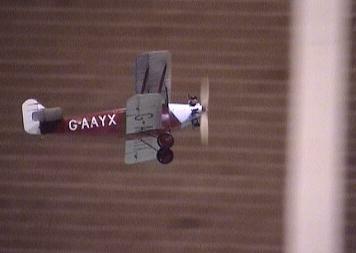 The Fox Moth flew nicely, but not for particularly long - 27 seconds from a take-off being the best it could manage. It would have done a bit better had it not hit a basketball net on one flight, and then assaulted the judges on another. Anyway, both models finished up 4th in their respective classes, which in view of the high standard of the competition, I have to be pleased with. Mike Hadland managed to win three out of the four classes this year, which was a fantastic achievement. Pistachio and Peanut scale, both with Bucker Jungmanns, and Open Rubber with his Waco SRE. 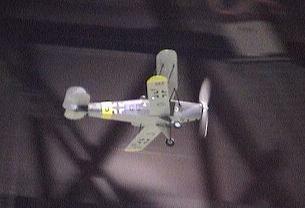 Here is the Peanut Jungmann circling gently just the right distance away from the roof structure. Richard Crossley's new model provoked a great deal of interest and made a lot of people (including me) smile. It was a beautifully executed replica of the aircraft featured in the movie "Flight of the Phoenix" (the original, not the recent re-make). All the actors who made their escape from the desert have been faithfully reproduced in carved foam, clinging to the surface of the wing. Even the monkey in a bag is there, complete with tiny paper ears! 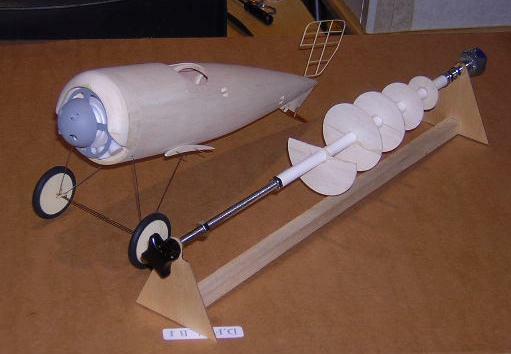 The model itself is of conventional balsa and tissue construction, with an especially light rear end to compensate for the unusually long tail moment and short nose. The electric motor and battery were also placed as far forwards as possible. As usual from Richard, the documentation was nearly as impressive as the model, featuring a set of specially made scale drawings and lots of stills from the film. He also got a special T-shirt made with the logo of the fictional oil company featured on the aircraft in the film! The model needed careful trimming, and to start with a hand launch was made to get a qualifing flight, but in the afternoon session, Richard had it taking off and circling very nicely. A welcome visitor from France was Thierry Bachellier, who on his first visit to the Nationals was delighted to finish second in the peanut scale class with this lovely Bucker Jungmeister. The Swiss colour scheme was most attractive. Anybody spot the special guest pilot? Another first-timer at the Nationals was Dave Fisher, who entered a P-51D Mustang in both the peanut scale and Open Rubber classes. The model is of foam construction. Finishing 7th in the Open Rubber class at the first attempt was an excellent achievement, and after Dave had opened up the turn a little, the final flight in the second session was particularly impressive. Hopefully the bug has well and truly bitten and he will be back again next year. 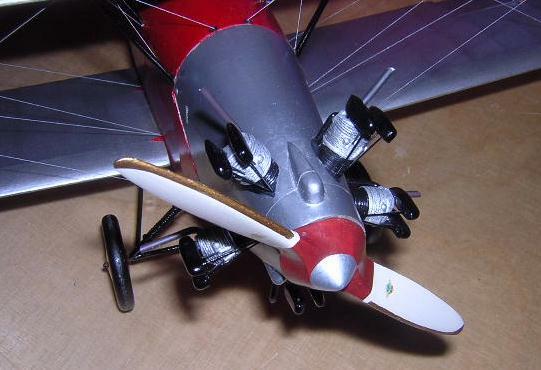 Here is a close-up shot showing the excellent engine detail on Andre Petit's delightful model of the Shuttleworth Collection's Southern Martlet. He told me he had been up to Old Warden the day before and had the chance to sit in the cockpit of the full size one (lucky chap). The model finished second in the Open Rubber class behind Mike Hadland's Waco SRE. Gordon Hannah had this new peanut scale Wight Baby – a very interesting prototype. Scored well in static, but was not cooperating in the flying department. Gordon has now decided to put himself in the cockpits of his models, so is carving self portraits – you can see one here. Reg Boor entered this new Messerschmitt Bf 109G in Open Rubber. 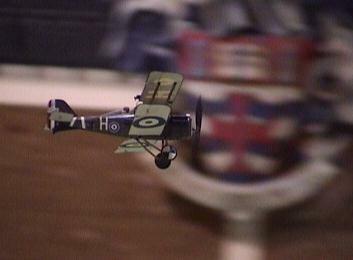 It was a fast, stable flier, and scored well, eventually finishing 6th in class. 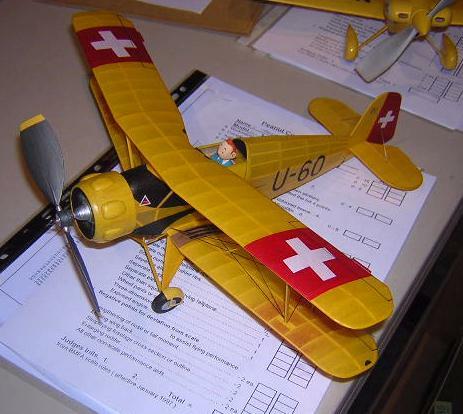 Another of the French contingent, Jacques Cartigny, brought this charming peanut scale Sablatnig FK1 monoplane. 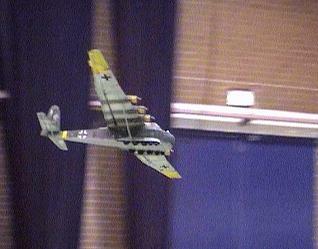 It was an excellent performer, with a best flight of 61 seconds recorded. 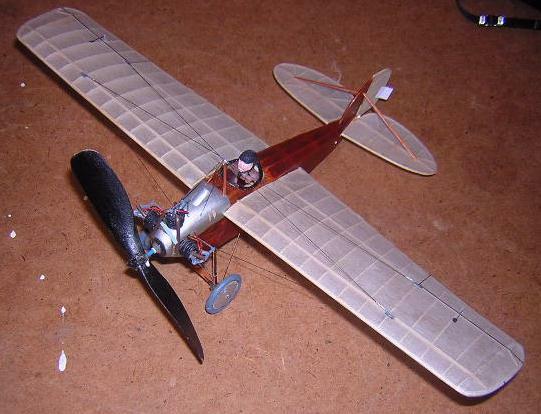 Mike Green built this nicely finished ANEC 1a ultralight for the electric/CO2 class. This is a subject I have considered for peanut scale, as there is plenty of wing area there. 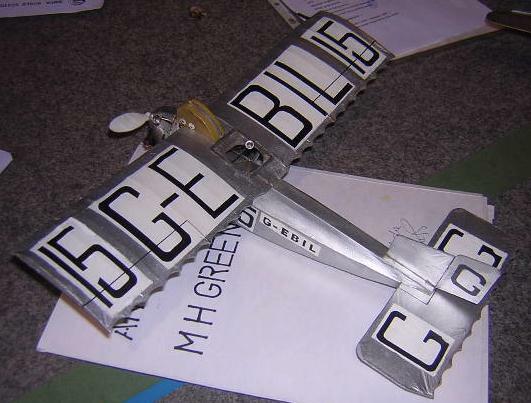 Mike’s model was CO2 powered, and flew well, if a touch faster than the real one ever did. 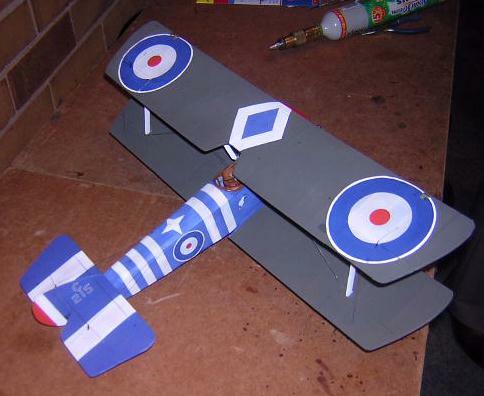 Dave Causer had built a new model for this year’s event – a Sopwith Pup in a colourful training scheme. Unfortunately, despite heroic trimming efforts during the day, a qualifying flight could not be achieved. I am sure it will be a strong contender at future meetings though. Great to see that Phil Siddall’s perseverance with his 1909 Avro Triplane has paid off, and we witnessed two qualifying flights this year. 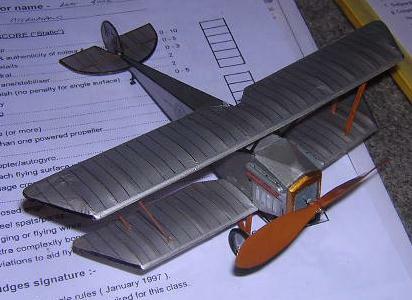 The model is a delight in the air, as flies very slowly indeed – probably close to scale speed in fact. Eagle eyed viewers will spot the tell tale evidence of a blown motor on the upper fuselage. 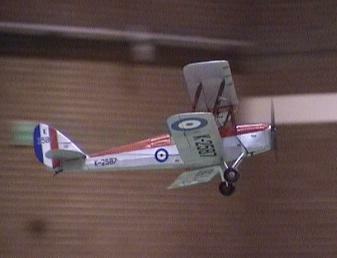 Derek Knight’s electric Tiger Moth scored very well in static as usual, but only managed one (excellent) qualifying flight – the one featured here. Even though the landing was interrupted by the tennis nets, he still managed to take third place in the electric/CO2 class. Lawrence Marks had his new rubber powered Swee’Pea racer finished in time for the event, but unfortunately ran into trimming problems and failed to register a flight. 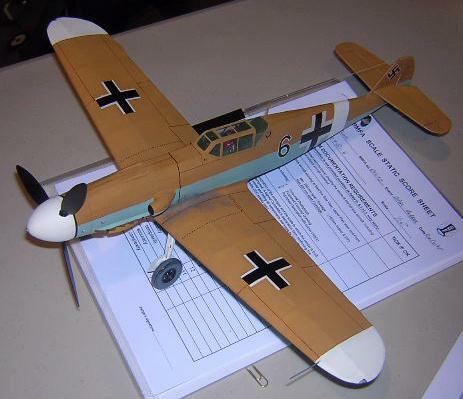 As last year, Pete Smart won the electric/CO2 class with his Messerschmitt Me 323 – a very impressive model, and a real crowd pleaser. Peter had the trim spot on for this competition and flight scores would have been impressive even without the 20% multi-engine bonus. Lovely little Microplano Veloz entered in the Pistachio class by Reg Boor. 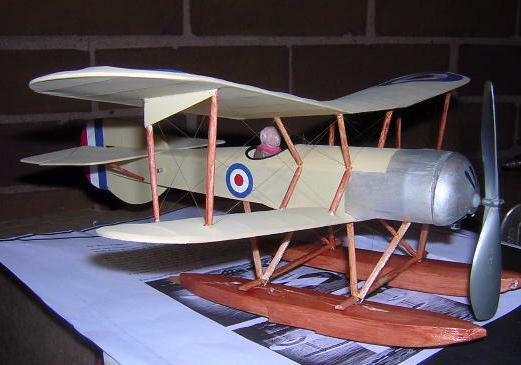 Here is Divs Masters' SE5a, which got the highest static score of all the Peanut Scale entries. 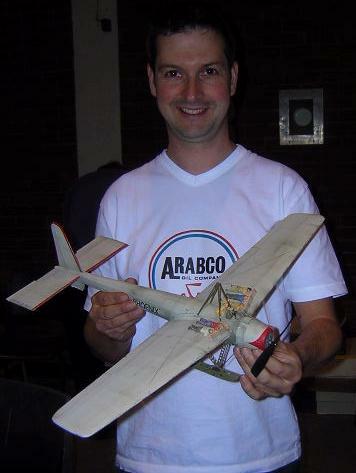 Best flight on the day was 32 seconds - not quite enough to get the model into the top placings. 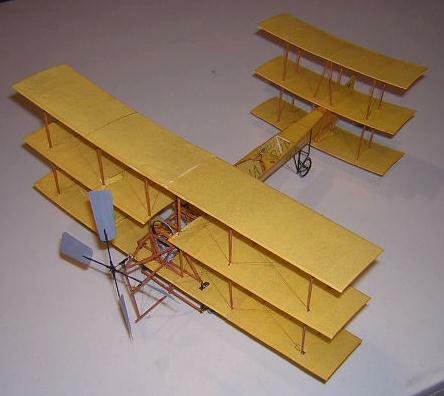 It is always interesting to see what Peter Iliffe is working on next, and here is the fuselage of his new Siemens Schuckert D-III, together with the jig on which it was built. The formers you see on the jig had laminated outlines wrapped round them onto which the balsa panels were attached. Parts of the fuselage are only about 1/64 " thick after sanding and if you held it up to the light you could see through it.